Just Listed :: Updated Townhome in Brookhaven's Druid Knoll! 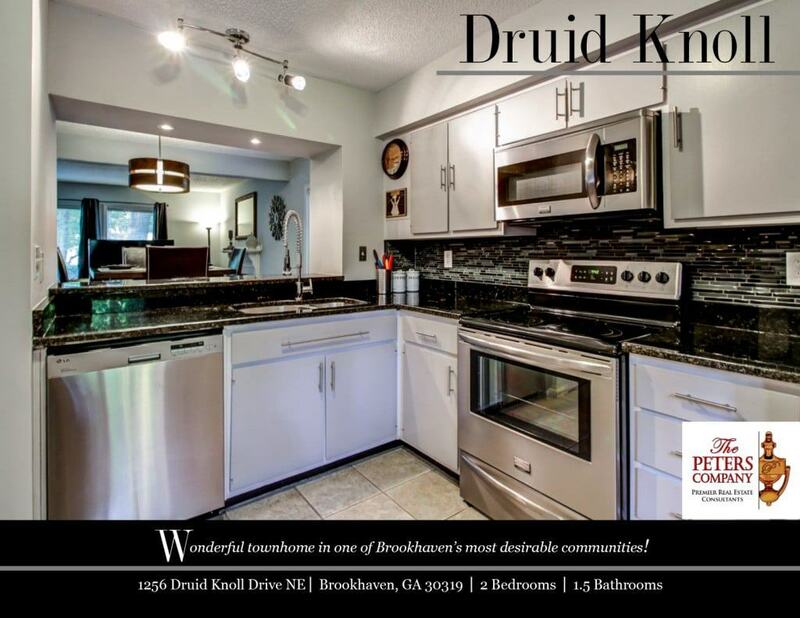 Welcome home to this wonderful end unit townhome in the popular Druid Knoll community. The flowing floor plan, custom features, and charming character will never go out of style. The close proximity to Peachtree Road, I-85, and GA400 makes it convenient to and from any direction. Being in the booming City of Brookhaven means you can enjoy the shopping and restaurants in nearby hot spots like Town Brookhaven and Village Place Brookhaven! · Updated kitchen features stainless steel appliances, granite countertops, plenty of cabinet space, sleek tile backsplash, and pantry. · The main living area includes a nice combination of living room and dining area which are perfect for entertaining. · The spacious living room also boasts a cozy wood burning fireplace. · A main level half bathroom is ideal for guests. · Master suite is a true retreat that includes a huge walk-in closet and wonderful balcony. · Additional bedroom is well-sized and bright with generous closet space. · Spa-like bathroom has dual vanities with granite countertops and stunning walk-in shower. · The large patio is great for outdoor enjoyment and entertaining. · Wonderful community amenities include professional landscaping and a well-maintained pool. · Great location close to interstates, shopping, and restaurants! ← Just Listed :: Charming Huntley Hills Traditional!